(TibetanReview.net, Dec11, 2014) – County officials attacked and thereby provoked a clash with Tibetan villagers on Dec 7 after the latter refused to vote for a government-supported candidate for the election of a township administration official, reported Radio Free Asia (Washington) Dec 9. 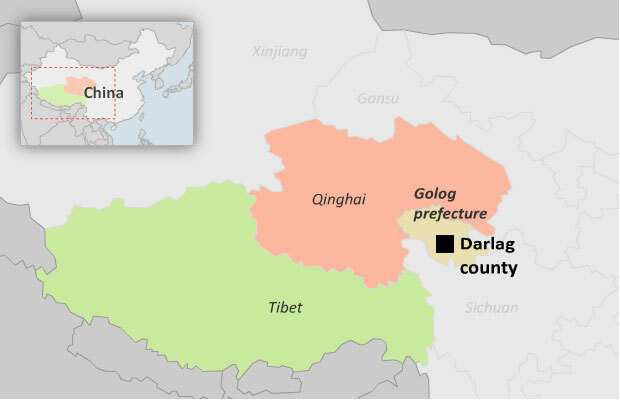 The report said the election was being held in Townships across Darlag (Chinese: Dari) County of Golog (Guoluo) Prefecture, Qinghai Province and did not say whether anyone was injured or detained. The incident occurred during an election meeting attended by residents and officials of the county’s Taktak Township. While the officials insisted that a man named Tenkyab favoured by them should be elected, the villagers disagreed. The latter instead proposed that another man named Lokar, having 16 years’ official experience, be elected. The villagers’ proposal angered the officials and one of them, Rinchen Tso, attacked two villagers named Tsephel and Tsekyab, grabbing them by their hairs and beating them. Verbal clashes ensured between the Tibetan public and the officials. Many villagers did not vote while the votes that had been cast were confiscated, the report said. It indicated that the villagers, who latter dispersed, were resigned to seeing Tenkyab being declared elected.